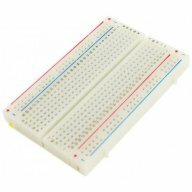 This is a half size breadboard, good for small projects. It's 8.2 cm x 6.2 cm with a standard double-strip in the middle and two power rails on both sides. You can pull the power rails off easily to make the breadboard as thin as 3.5cm and stick it onto an Arduino protoshield. You can also cut these in half with a saw to create 2 tiny breadboards, or "snap" these breadboards together either way to make longer and/or wider breadboards. Dieser Artikel wurde am Donnerstag, 28. Juni 2012 im Shop aufgenommen.